It was the summer resort of emperors of the Qing Dynasty (1644-1911). It was their official residence, seat and hunting ground from May to September. This let them escape the summer heat of Beijing. The Chengde Mountain Resort's palace complex, pavilions, temples, extensive gardens, meadows and forests lie in a scenic valley and are well preserved. Unlike large palace complexes built elsewhere in China (which includes the Forbidden City in Beijing), the Chengde structures were built to fit harmoniously with the landscape. The architects of the palace buildings and gardens purposely borrowed design elements from different regions of China, including Tibet. The emperor believed this eclectic approach would please his subjects around the country. 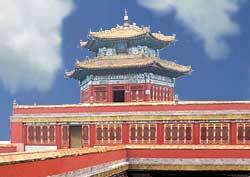 It took 89 years (1703 to 1792) to complete the Chengde Mountain Resort.